During 1968 Barbirolli acceded to a plea to musicians by Rafael Kubelík not to conduct in countries which supported the Russian invasion of Czechoslovakia. By this splendid gesture he deprived himself of the chance to conduct the recording of Die Meistersinger which EMI had hoped to make with the Dresden company in East Germany. Quote is from Barbirolli by Michael Kennedy. Header photo shows Herbert von Karajan signing autographs outside Dresden's Lukaskirche. It was taken in November 1970 during a break from recording sessions for EMI's Die Meistersinger. 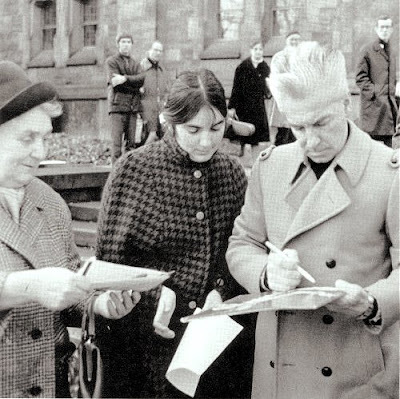 Karajan was recording the opera with the Dresden State Orchestra and Opera Chorus. 1968 will be remembered as a political annus horribilis rather than the centenary of the first performance of Die Meistersinger. But a centenary production of the opera in London made the reputation of another great Wagnerian whose music also sounds better than his politics. Others made different gestures. Rafael Kubelík had left Czechoslovakia following the Communist coup in 1948 vowing never to return until the country was liberated. He kept this promise and finally returned to conduct Smetana's Má Vlast at the Prague Spring Festival in 1990 following the overthrow of Communism. Read the story here. I was hoping that moving 1990 performance would be on YouTube, but my search has drawn a blank. Instead here is Kubelík conducting the Bavarian Radio Symphony Orchestra in Moldau from Má vlast in 1984. Now on Facebook and available via Twitter @overgrownpath. Barbirolli by Michael Kennedy was bought at retail price. Photo credit EMI. Any copyrighted material on these pages is included as "fair use", for the purpose of study, review or critical analysis only, and will be removed at the request of copyright owner(s). Report broken links, missing images and errors to - overgrownpath at hotmail dot co dot uk.